Welcome Pathfinder fans! 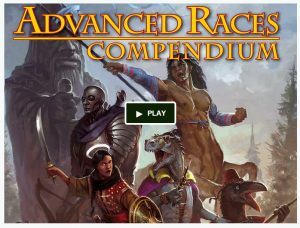 Steven T Helt (or, you know, Famine) back again to tease out some really great content for the Advanced Races Compendium. Today I want to whet your appetites and tell you about a stretch goal we haven’t reached yet. Keep in mind, this chapter isn’t guaranteed to make it into the book until backing for the project reaches $35,000, so we all have a little work cut out for us! If we do reach that goal (and I hope we shoot far beyond it so I can develop my friend Victoria’s awesome ideas for dhampir! ), you’re gonna get to see the following details in the drow chapter. Keep in mind this is just a taste! The full details for these goodies have to wait for the book, and there are many more cool ideas than just these! —Rules for the sinner cleric archetype, complete with variant channeling and exclusive domains for each classic deadly sin! Here’s a peek at my personal favorite…GLUTTONY! You gain power through overindulgence. Expansive Gullet (Su): Your mouth and stomach can magically expand to accept any non-living objects of up to one size smaller than yourself. Storing or retrieving an object is a standard action. Objects stored in this manner are not damaged and do not accidentally injure you. You may store objects weighing up to your light load, and objects stored do not count against your carrying capacity. Ingestion (Su): At 6th level, you may consume any edible magic item or potion stored on your person or within your expansive gullet without retrieving the object. At 12th level, you may consume the object as a move action. At 20th level, you may consume the object as a swift action. —More new archetypes such as the fell binder, poison fang, and shadow caller! —Balefire, blackrods, and many more bits of variant alchemical equipment! —I kid you not: Rules for tinkering and creating variant poisons. Cause fighting fair is for ninny pale-skinned surface elves. —New feats. I have chosen an awesome example in Boon of Gluttony. Cause, you know, Famine! Your demonic patron lends you greater power through consumption, but tempts you to overindulge. Benefit: Whenever you drink a potion that does not have an instantaneous duration, you may halve the potion’s normal duration to cause it to function at a caster level equal to your character level. This feat may not be combined with the extend potion alchemist discovery. —I can’t tease everything. This is will be one of the larger chapters of the book. So new equipment and magic items, demonic patrons, spells (yes, there is actually a spell called metamorphic ruin), and a BADASS DROW ARTIFACT that could fuel an entire campaign. But hey, whether as PCs, antiheroes, or antagonists, we all love drow and they have a solid place in almost every D&D or Pathfinder campaign. This chapter will really get the juices flowing, but it unlocks at $35,000 and we absolutely need everyone on board to get there. Tell your friends! Tell your gaming group! If your gaming group bands together to support a print copy, I’ll give all your PCs 1,000 experience points, and all your NPCs +1 to all their saves! Heck, if one or two gaming groups are savvy enough to back at our highest level (it’s not so bad if you split the cost among the group), I’ll promise to tailor a game at Gen Con around the plot you want, and I DARE you to make the game about the drow artifact. That’s enough teasing for now, friends. 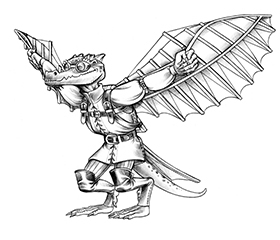 Please hit your social media and the Paizo boards and let everyone know how crucial it is we soar past this important stretch goal! huzzah! tremble in fear, pathetic surface-dwellers!